Check-In – Competitors will be checked in and weighed. All suit bottoms must be V-shaped, no thongs are permitted. Suits worn by female competitors at the Prejudging must be two-piece and plain in color with no fringe, wording, sparkle or fluorescents. Suites worn by female competitors at the Finals must be two-piece but may include a printed design with fringes, lace, sparkle or fluorescents that are in good taste. All Prejudging suits will be checked at the morning check-in. Competitors are not permitted to alter the fit of the posing suit by hiking it up in the back or by pulling up the sides during Front and Rear Lat Spreads. Posing Music will be used at the Finals only. Posing Music must be on CD and must be the only music on the CD. Posing Music should be cued to the start of the music. During the Prejudging male and female competitors are not permitted to wear any jewelry onstage other than a wedding band. Decorative pieces in the hair are not permitted. During the Finals female competitors are permitted to wear earrings. Competitors numbers will be worn on the left side of the suit bottom during both Prejudging and Finals. Any competitor disqualified for health reasons must be checked by the attending EMT and, if it is advised by the EM1 must go to the nearest hospital for evaluation. Lightweight,……………Up to including 125 lbs. Heavyweight….. …. ….Over 125 lbs. Middleweight………..Over 125 up to including 140 lbs. Heavyweight …. ……Over 140 lbs. Lightweight…………….Up to including 115 lbs. Middleweight………….Over 115 up to Including 125 lbs. Light-Heavyweight…..Over 125 up to including 140 lbs. Heavyweight. …….. …Over 140 lbs. 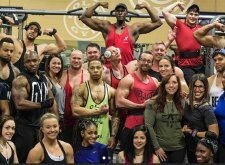 NOTE: Class Winners of the drug-free NPC Team Universe Championships go on to represent the United States in the IFBB World Championships that follow the IFBB weight limits below and for all polygraph tested events. Lightweight…………….Up to including 114 ½ lbs. Middleweight …………Over 114 ½ up to including 125½ lbs. Heavyweight…… …….Over 125 ½ lbs. Judges will score competitors according to the NPC “Total Package” which is a balance of Size, Symmetry and Muscularity. Your head must be facing the same direction as your feet. Begin when ready — no signal is necessary from the Head Judge. Maximum of 60 seconds with a warning when 10 seconds remain. You are not obligated to use all 60 seconds. Lying on the floor is not permitted. Residency is Four (4) months prior to a Contest or must be a Full-time Student in the area. Who Qualifies for National Level Competitions? A competitor must place in the Top Two (2) in their Weight Class of the Men’s Open or in the Top Three (3) In their Weight Class of the Women’s Open in a contest that has been sanctioned as a National Qualifier. First Overall In an Area Championship of the Open division. Top Two (2) In a Weight Class from an Area Level National Qualifier. Overall Winner in a Distinct Level Competition designated as a National Qualifier. Winner of the Weight Class in a Regional Competition designated as a National Qualifier. Weight Class Winners from the Armed Forces. This qualifies the Competitor for competition on the National Level for a penod of One (1) Full Calendar Year after the year that the qualification took place. Only it a competitor’s One (1) Year Qualification has expired can an athlete enter a State or higher level National qualifying competition even if they have already won the Overall title. Top Five (5) in a Weight Class from a National Level Competition. Top Three (3) in a Weight Class in the Teen or Masters Nationals. Class Winner in the Armed Forces. Top Three (3) in a Weight Class from an Area National Qualifier. Top Five (5) in a Weight Class from the Nationals, USA, Team Universe, or Junior Nationals. Top Three (3) in a Weight Class from the Teen, Collegiate Masters Nationals. First Overall in an Area Level National Qualifier. Top Two (2) in an Area Level National Qualifier. Weight Class Winner from a District Level Competition designated as a National Qualifier. Top Five (5) in a Weight Class from the Nationals, USA, or North American Championships. Top Five (5) in a Weight Class from the Teen, Collegiate Masters Nationals. Top Two (2) in a Weight Class in the Armed Forces. First Overall in an Area Level Competition of the Unrestricted Class. Top Two (2) in a Weight Class in an Area Level National Qualifier. Overall Winner in a District Level Competition designated as a National Qualifier. Class Winners at the USA and Nationals will be given Five (5) years of eligibility.